In a sure sign that fire season is here the CAL FIRE Hollister Air Attack Base is now staffed with an air tanker and an air tactical reconnaissance and coordination airplane. 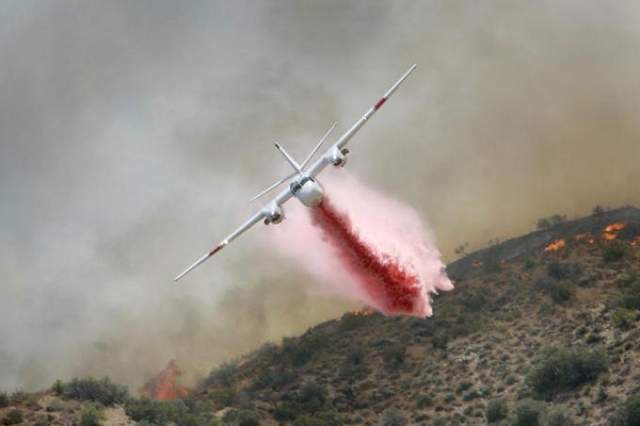 Two S2T air tankers will be assigned to Hollister ready to drop fire retardant on any wildfires breaking out statewide, CAL FIRE said in a news release. As of Monday one air tanker and the air tactical plane were ready to go. The twin-engine, highly maneuverable S2Ts are former U.S. Navy patrol planes that have a capacity to carry 1,200 gallons of retardant. With longer, warmer days and drier conditions fire danger starts to increase, said CAL FIRE. “The recent rains, while beneficial, did not make up for months of below average precipitation in the San Benito and Monterey County areas where we are in moderate drought condition,” said the news release. The Hollister base is under the command of newly-appointed Battalion Chief Josh Nettles. Nettles, who took over on April 30, has been in the fire service since 1998. He is a certified Air Tactical Group Supervisor and has a private pilot’s license. CAL FIRE has operated an air attack base at the Hollister Municipal Airport for 50 years. The base has living quarters, a retardant mixing base, control tower and mechanical shop. New fires in California can be reached within 20 minutes with 23 air tankers placed strategically around the state, CAL FIRE said.